ab156622 only detects Tau phosphorylated on serine 198.
corresponding to Human Tau. A phospho-specific peptide corresponding to residues surrounding serine 198 of Human Tau. SH-SY5Y cell lysates. Human brain tissue. ab156622 is a PBS-only buffer formulated version of ab79540, containing no BSA or sodium azide, ideal for antibody labeling. Please refer to ab79540 for information on protocols, dilutions, and image data. Our Abpromise guarantee covers the use of ab156622 in the following tested applications. WB 1/50000 - 1/100000. 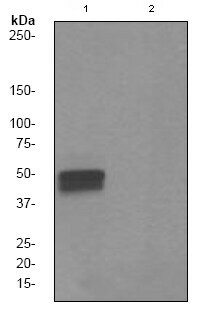 Detects a band of approximately 50-70 kDa (predicted molecular weight: 79 kDa). 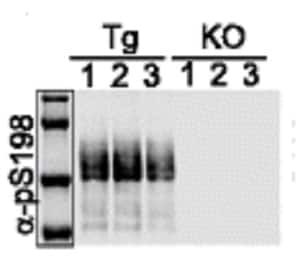 This WB data was generated using the same phospho Tau antibody clone, EPR2400, in a different buffer formulation (cat# ab79540). This IHC data was generated using the same phospho Tau antibody clone, EPR2400, in a different buffer formulation (cat# ab79540). ab79540, at 1/100 dilution, staining Tau (phospho S198) in paraffin-embedded human brain tissue by Immunohistochemistry. This ICC/IF data was generated using the same phospho Tau antibody clone, EPR2400, in a different buffer formulation (cat# ab79540). Immunocytochemistry/ Immunofluorescence analysis of hiPSC-derived neuronal cultures labeling Tau (phospho S198) with ab79540 at 1/100 dilution. Publishing research using ab156622? Please let us know so that we can cite the reference in this datasheet. There are currently no Customer reviews or Questions for ab156622.